As a single-man shop, my development categories are a little less formal than the ones you see from larger, more official organizations. OTOH, we have large, official organizations using release titles like "Pretentious Pangolin", so what the heck. This board has moved from, "eeyeah.. not yet" to "release candiate, assuming it actually works." That qualifier is important. It's easy to set yourself up for disappointment and frustration at this point. You've put in a lot of effort, you've solved a lot of problems, and you want to believe that solve them all. You don't want to rip out all the work you've just done and start over because you made some connection backwards. It happens though. The layout process is all about focusing on details. For this board, I spent a lot of time trying things that would buy me (or cost me) fifty thousandths of an inch. When you spend all your time at that level, it's easy to lose track of the bigger things. The biggest problems come from small-scale solutions that impose large-scale changes. That resistor in the lower right that carries a signal over a track is a perfect example. 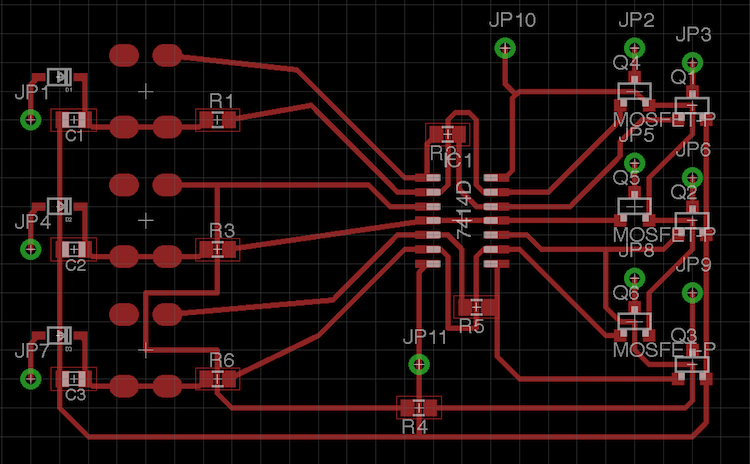 Adding that component made the layout much simpler, but did change the circuit as a whole. In this case the large-scale change was nothing more than putting a resistor in series with the gate of a mosfet (changes the mosfet's timing by -- in this case -- a few nanoseconds), but it's still a change. A larger change with more potential to cause problems involves the diodes all the way to the left. I know they'll work in the orientation shown, I'm just not positive that they'll do what I want. I may need to flip them around. Fortunately I can do that without having to change the board. The upshot is that I know this board may still have problems. It looks nice, and it's good enough to etch, build, and test, but I won't be crushed if the test shows me problems. Just getting a design to a stage where you can let the smoke out is an achievement. If there are issues, I'll deal with them, and the next version will be better. 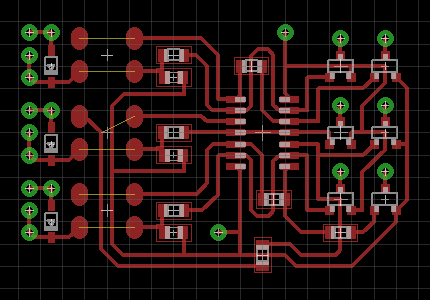 Eventually I'll run out of ways to design a board that doesn't work, and will get one that reaches the end of the checklist without causing problems.. and that's always a rush, no matter when it happens.